At San Diego Comic-Con 2012, a company called Allegory had a pretty awesome piece on display. 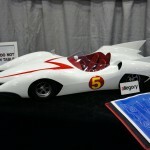 They had a Limited Edition Speed Racer Mach 5. These were hand crafted and limited to 100 total pieces. They were selling 1 of 100 for $3000. Too rich for most of our wallets. But it did look pretty awesome. Check it out after the jump.